Japanese Prime Minister Shinzo Abe, European Commission President Jean-Claude Juncker, left, and European Council President Donald Tusk, right, after their joint press conference in Tokyo, Japan, July 17, 2018 (AP photo by Koji Sashara). 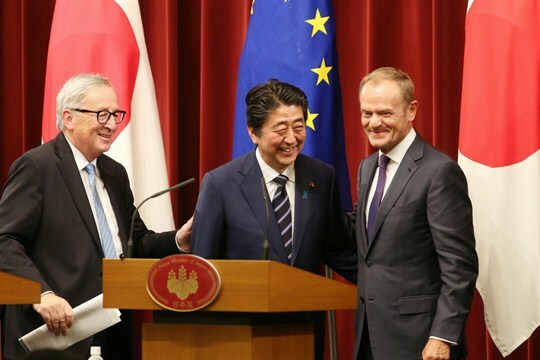 Earlier this month, Japan and the European Union concluded a mega-free trade deal that, when ratified, is expected to provide significant benefits to both sides. But as important as the economics of the deal is its symbolism, demonstrating a commitment to an international trade regime that has been passing through a zone of turbulence over the past year, largely due to arcane protectionist measures from the Trump administration. The U.S. has imposed large tariffs and threatened more on a wide range of products and countries, including allies such as Japan, Canada, Mexico and the European Union.